The RFJ-3TP 2.7-mt. professional series garage floor jack is perfectly suited for the auto shop or your home garage. Just over 483 mm of lift makes this a remarkably fast-lifting jack that’s perfect for fast-moving shops and private users that want a commercial-grade jack in the comfort of home. The RFJ-3TP is a versatile lifting machine designed to meet a variety of everyday duties. Capable of handling a full 2,722 kg load, this trusty floor jack is made out of heavy-gauge steel to ensure maximum durability under tremendous pressure. As with every Ranger floor jack, the RFJ-3TP exceeds all ANSI standards in performance and safety. 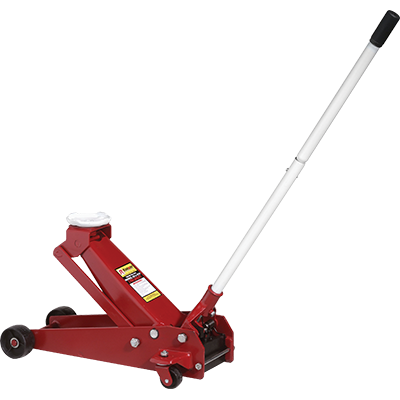 This jack is designed to handle most residential vehicles, including light trucks and SUVs. With a 133 mm in collapsed profile, this isn’t one of our super-low-profile models, but it is ideal for average sedan heights and heavier-duty vehicle types. It’s also exceptional lightweight, so you get an incredible power-to-weight ratio that surely explains why this floor jack is a staple in garages worldwide.